"Modern Age" redirects here. For the periodical, see Modern Age (periodical). The term modern was coined in the 16th century to indicate present or recent times (ultimately derived from the Latin adverb modo, meaning "just now"). The European Renaissance (c. 1420–1630), which marked the transition between the Late Middle Ages and Early Modern times, started in Italy and was spurred in part by the rediscovery of classical art and literature, as well as the new perspectives gained from the Age of Discovery and the invention of the telescope and microscope, expanding the borders of thought and knowledge. The Soviet famine (1932–1933), including the Holodomor in Soviet Ukraine and the Kazakh famine in Soviet Kazakhstan. Historians consider the early modern period to be approximately between 1500 and 1800. It follows the Late Middle Ages and is marked by the first European colonies, the rise of strong centralized governments, and the beginnings of recognizable nation-states that are the direct antecedents of today's states. The expansion of Islam took place in North and East Africa. In West Africa, various native nations existed. The Indian Empires and civilizations of Southeast Asia were a vital link in the spice trade. On the Indian subcontinent, the Mughal Empire existed. The archipelagic empires, the Sultanate of Malacca and later the Sultanate of Johor, controlled the southern areas. Various Chinese dynasties and Japanese shogunates controlled the Asian sphere. 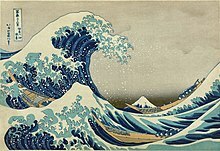 In Japan, the Edo period from 1600 to 1868 is also referred to as the early modern period. In Korea, the early modern period is considered to have lasted from the rise of the Joseon Dynasty to the enthronement of King Gojong. In the Americas, Pre-Columbian peoples had built a large and varied civilization, including the Aztec Empire and alliance, the Inca civilization, the Mayan Empire and cities, and the Chibcha. In the west, kingdoms of Europe moved in the direction of reformation and expansion. Russia reached the Pacific coast in 1647 and consolidated its control over the Russian Far East in the 19th century. Later religious trends of the period saw the end of the aforementioned Muslim expansion. Christians and Christendom saw the end of the Crusades and of religious unity under the Roman Catholic Church. It was during this time that the Inquisitions and the Protestant Reformation took place. The Qing Chinese celebrate a victory over the Kingdom of Tungning in Taiwan. Painting was a collaboration between Chinese and European painters. "A date around 1780 as the beginning of modern China is thus closer to what we know today as historical 'reality'. It also allows us to have a better baseline to understand the precipitous decline of the Chinese polity in the nineteenth and twentieth centuries." 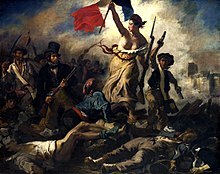 Eugène Delacroix's Liberty Leading the People (1830). The French Revolution inspired a wave of revolutions across Europe. Liberalism and Nationalism were popular ideas that challenged Absolute Monarchies in the 19th century. The Legislative Assembly was the legislature of France from October 1, 1791, to September 1792. It provided the focus of political debate and revolutionary law-making between the periods of the National Constituent Assembly and of the National Convention. 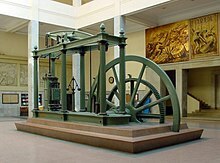 The development of the steam engine started the Industrial Revolution in Great Britain. The steam engine was created to pump water from coal mines, enabling them to be deepened beyond groundwater levels. The date of the Industrial Revolution is not exact. Eric Hobsbawm held that it "broke out" in the 1780s and was not fully felt until the 1830s or 1840s, while T.S. Ashton held that it occurred roughly between 1760 and 1830 (in effect the reigns of George III, The Regency, and George IV). The great changes of centuries before the 19th were more connected with ideas, religion or military conquest, and technological advance had only made small changes in the material wealth of ordinary people. The major European powers laid claim to the areas of Africa where they could exhibit a sphere of influence over the area. These claims did not have to have any substantial land holdings or treaties to be legitimate. The European power that demonstrated its control over a territory accepted the mandate to rule that region as a national colony. The European nation that held the claim developed and benefited from their colony's commercial interests without having to fear rival European competition. With the colonial claim came the underlying assumption that the European power that exerted control would use its mandate to offer protection and provide welfare for its colonial peoples, however, this principle remained more theory than practice. There were many documented instances of material and moral conditions deteriorating for native Africans in the late nineteenth and early twentieth centuries under European colonial rule, to the point where the colonial experience for them has been described as "hell on earth." 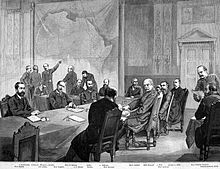 At the time of the Berlin Conference, Africa contained one-fifth of the world's population living in one-quarter of the world's land area. However, from Europe's perspective, they were dividing an unknown continent. European countries established a few coastal colonies in Africa by the mid-nineteenth century, which included Cape Colony (Great Britain), Angola (Portugal), and Algeria (France), but until the late nineteenth century Europe largely traded with free African states without feeling the need for territorial possession. Until the 1880s most of Africa remained uncharted, with western maps from the period generally showing blank spaces for the continent's interior. From the 1880s to 1914, the European powers expanded their control across the African continent, competing with each other for Africa's land and resources. Great Britain controlled various colonial holdings in East Africa that spanned the length of the African continent from Egypt in the north to South Africa. The French gained major ground in West Africa, and the Portuguese held colonies in southern Africa. Germany, Italy, and Spain established a small number of colonies at various points throughout the continent, which included German East Africa (Tanganyika) and German Southwest Africa for Germany, Eritrea and Libya for Italy, and the Canary Islands and Rio de Oro in northwestern Africa for Spain. Finally, for King Leopold (ruled from 1865 to 1909), there was the large “piece of that great African cake” known as the Congo, which became his personal fiefdom. By 1914, almost the entire continent was under European control. Liberia, which was settled by freed American slaves in the 1820s, and Abyssinia (Ethiopia) in eastern Africa were the last remaining independent African states. After the death of the Meiji Emperor, the Taishō Emperor took the throne, the Taishō period was a time of democratic reform granting democratic rights to all Japanese men. Foreigners would instrumental in aiding in Japan's modernization. A key foreign observer of the remarkable and rapid changes in Japanese society in this period was Ernest Mason Satow. In China, the Qing Dynasty was overthrown following the Xinhai Revolution. The Xinhai Revolution began with the Wuchang Uprising on October 10, 1911, and ended with the abdication of Emperor Puyi on February 12, 1912. 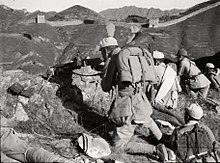 The primary parties to the conflict were the Imperial forces of the Qing dynasty (1644–1911), and the revolutionary forces of the Chinese Revolutionary Alliance (Tongmenghui). Italian Arditi troops using gas-masks to protect themselves from Chemical Warfare, used for the first time in WWI. In the 1920s movie theaters became popular in American and European communities. 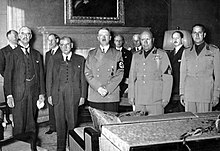 U.K Prime Minister Nevil Chamberline attempted to negotiate with Adolf Hitler as Nazi Germany practiced an expansionist policy. Following the lull in fighting, known as the "Phoney War", Germany invaded western Europe in May 1940. Six weeks later, France, in the mean time attacked by Italy as well, surrendered to Germany, which then tried unsuccessfully to conquer Britain. On September 27, Germany, Italy, and Japan signed a mutual defense agreement, the Tripartite Pact, and were known as the Axis Powers. Nine months later, on June 22, 1941, Germany launched a massive invasion of the Soviet Union, which promptly joined the Allies. Germany was now engaged in fighting a war on two fronts. This proved to be a mistake by Germany – Germany had not successfully carried out the invasion of Britain and the war turned against the Axis. Atomic Bomb Test, 1946. The use of Nuclear strikes on Hiroshima and Nagasaki brought WWII to an abrupt end. During Pax Americana, the popular music industry flourished. Pictured here is the Beatles Group. In China Mao Zedong (Máo zé dōng) utilized Marxist-Leninist thought. When the Communist Party of China assumed power in 1949, previous schools of Chinese thought, excepting notably Legalism, were denounced as backward. Many parts of China's past were even purged during the Cultural Revolution. Though initially friendly with the Soviet Union the Chinese and Soviet communists diverged in the Sino-Soviet split of 1960. Through the end of the Cold-War, China would continue on its own path from other communist countries, building better relations with the United States after 1972. China's economy would recover from the Cultural Revolution due to market-oriented reforms led by Deng Xiaoping. The Space Age is a period encompassing the activities related to the Space Race, space exploration, space technology, and the cultural developments influenced by these events. The Space Age began with the development of several technologies that culminated with the launch of Sputnik 1 by the Soviet Union in October 1957. This was the world's first artificial satellite, orbiting the Earth in 98.1 minutes and weighing in at 83 kg. The launch of Sputnik 1 ushered a new era of political, scientific and technological achievements that became known as the Space Age. The Space Age was characterized by rapid development of new technology in a close race mostly between the United States and the Soviet Union. The Space Age brought the first human spaceflight during the Vostok programme and reached its peak with the Apollo program which captured the imagination of much of the world's population. 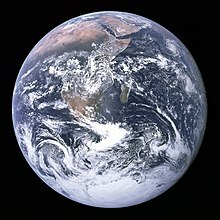 The landing of Apollo 11 on the Moon was an event watched by over 500 million people around the world and is widely recognized as one of the defining moments of the 20th century. Since then, and with the end of the space race due to the dissolution of the Soviet Union, public attention has largely moved to other areas. ^ Intrinsic to the English language, "modern" denotes (in reference to history) a period that is opposed to either ancient or medieval; modern history is the history of the world since the end of the Middle Ages. ^ "The Century Dictionary and Cyclopedia". 1906. ^ "Bartleby.com: Great Books Online – Quotes, Poems, Novels, Classics and hundreds more". Archived from the original on 2008-06-22. ^ "World Population to Hit Milestone With Birth of 7 Billionth Person". PBS.org. 2011-10-27. Retrieved 31 July 2017. ^ Nation, civil society and social movements: essays in political sociology by T.K. Oommen. p. 236. ^ Griffin, D.R. (1990). Sacred interconnections: Postmodern spirituality, political economy, and art. SUNY series in constructive postmodern thought. Albany: State University of New York Press. ^ Maine, H.S., & Dwight, T.W. (1888). 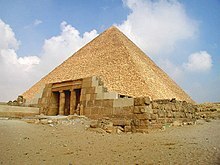 Ancient law: Its connection with the early history of society and its relation to modern ideas. New York: H. Holt and Co.
^ Maine, Sir Henry Sumner (1875). "Lectures on the Early History of Institutions". ^ "Modern". Oxford English Dictionary. Oxford University Press. Retrieved 29 August 2015. ^ Baird, F.E., & Kaufmann, W.A. (2008). Philosophic classics: From Plato to Derrida. Upper Saddle River, NJ: Pearson/Prentice Hall. ^ "Islamic Culture and the Medical Arts: Late Medieval and Early Modern Medicine". ^ Marx, Durkheim, Weber: Formations of Modern Social Thought by Kenneth L. Morrison. p. 294. ^ Crawley, C.W. (1965). The new Cambridge modern history. Volume 9., War and peace in an age of upheaval, 1793–1830. Cambridge: Cambridge University Press. ^ Goldman, E.O., & Eliason, L.C. (2003). The diffusion of military technology and ideas. Stanford, Calif: Stanford University Press. ^ Bloy, Marjie (30 April 2002). "The Congress of Vienna, 1 November 1814 – 8 June 1815". The Victorian Web. Retrieved 2009-01-09. ^ Duruy, V., & Grosvenor, E.A. (1894). History of modern times: From the fall of Constantinople to the French revolution. New York: H. Holt and company. ^ Johnson, P. (2001). Modern times: The world from the twenties to the nineties. New York: HarperPerennial. ^ Taylor, Alan (2001). American Colonies. New York: Penguin Books. ISBN 978-0-14-200210-0. 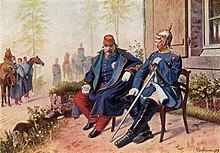 ^ "Ottoman Empire". Britannica Online Encyclopedia. Retrieved 2013-02-11. ^ "The Ming Voyages | Asia for Educators | Columbia University". afe.easia.columbia.edu. Retrieved 2018-09-21. ^ "Chapter 8 The New World". mygeologypage.ucdavis.edu. Retrieved 2018-09-21. ^ R. Keith Schoppa (2000). The Columbia Guide to Modern Chinese History. Columbia University Press. p. 15. ISBN 978-0-231-50037-1. ^ "Mughal Empire (1500s, 1600s)". bbc.co.uk. London: BBC. Section 5: Aurangzeb. Retrieved 18 October 2010. ^ Paul Oskar Kristeller, Humanism, pp. 113–114, in Charles B. Schmitt, Quentin Skinner (editors), The Cambridge History of Renaissance Philosophy (1990). ^ Joseph E Inikori. Africans and the Industrial Revolution in England, Cambridge University Press. ISBN 0-521-01079-9. ^ Business and Economics. Leading Issues in Economic Development, Oxford University Press US. ISBN 0-19-511589-9. ^ Russell Brown, Lester. Eco-Economy, James & James, Earthscan. ISBN 1-85383-904-3. ^ Cayley, E.S. (1856). The European revolutions of 1848. London: Smith, Elder & Co. Vol. I and II. ^ Harding, S.B., & Hart, A.B. (1918). New medieval and modern history. New York: American book company. ^ Solovyov, S. (2001). History of Russia from the Earliest Times. 9, ch.1. AST. ISBN 978-5-17-002142-0. Retrieved 27 December 2007. ^ F.K Richtmyer, E.H Kennard, T. Lauristen (1955). "Introduction". Introduction to Modern Physics (5th edition ed.). New York: McGraw-Hill Book Company. p. 1. LCCN 55--6862. 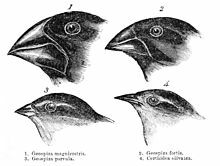 ^ The concepts derived are at times abstractions from nature for baselines or reference states. These can be unattainable in practice, such as free space (electromagnetism) and practical absolute zero temperature (ed. Special negative temperatures values are "colder" than the zero points of those scales but still warmer than absolute zero). ^ a b ter Haar, D. (1967). The Old Quantum Theory. Pergamon Press. p. 206. ^ Matrix mechanics and wave mechanics supplanted other studies to end the era of the old-quantum theory. ^ Modern Christian Thought: The twentieth century, Volume 2. By James C. Livingston, Francis Schüssler Fiorenza. p. 2. ^ "Herman Dooyeweerd". Routledge Encyclopedia of Philosophy. By Routledge (COR), Luciano Floridi, Edward Craig. p. 113. See also: D.H. Th. Vollenhoven. ^ Counter-Enlightenments: From the Eighteenth Century to the Present. By Graeme Garrard. Routledge, 2004. p. 13..
^ See also: Counter-Enlightenment, Max Weber, and Émile Durkheim. ^ Known as continental philosophy. ^ Compact Oxford English Dictionary. Oxford University Press. 2007. humanism n. 1 a rationalistic system of thought attaching prime importance to human rather than divine or supernatural matters. 2 a Renaissance cultural movement that turned away from medieval scholastic-ism and revived interest in ancient Greek and Roman thought. Typically, abridgments of this definition omit all senses except #1, such as in the Cambridge Advanced Learner's Dictionary, Collins Essential English Dictionary, and Webster's Concise Dictionary. New York: RHR Press. 2001. p. 177. ^ Collins Concise Dictionary. HarperCollins (published 1990). 1999. The rejection of religion in favour of a belief in the advancement of humanity by its own efforts. 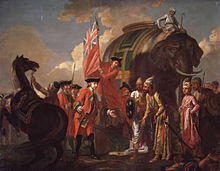 ^ Most notably by dividing the British crown into several sovereignties by the Statute of Westminster, the patriation of constitutions by the Canada Act 1982 and the Australia Act 1986, and by the independence of countries such as India, Pakistan, South Africa, and Ireland. ^ The Chinese Enlightenment. By Vera Schwarcz. p. 4. ^ Joseph, W.A. (2010). Politics in China: An introduction. Oxford: Oxford University Press. p. 423. ^ Williams, Beryl, The Russian Revolution 1917–1921, Blackwell Publishing Ltd. (1987), ISBN 978-0-631-15083-1: Typically, men of conscriptible age (17–40) in a village would vanish when Red Army draft units approached. The taking of hostages and a few exemplary executions usually brought the men back. ^ What Ended the Great Depression of 1929?. Source: The Federal Reserve Board web site, "Remarks by Governor Ben Bernanke at the H. Parket Willis Lecture in Economic Policy", March 2, 2004, FDR Library Web Site. ^ Doenecke, Justus D.; Stoler, Mark A. (2005). Debating Franklin D. Roosevelt's foreign policies, 1933–1945. Rowman & Littlefield. ISBN 978-0-8476-9416-7. ^ Gaddis, John Lewis (1972). 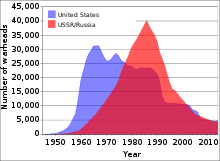 The United States and the Origins of the Cold War, 1941–1947. Columbia University Press. pp. 24–25. ISBN 978-0-231-12239-9. ^ J. Bradford DeLong, Cornucopia: Increasing Wealth in the Twentieth Century Archived 2005-12-30 at the Wayback Machine. 2000. ^ Morrison, Wayne. Theoretical criminology: from modernity to post-modernism. p. 53. ^ Victor Flores Olea. "Editoriales – El Universal – 10 de abril 2006 : Operacion Condor". El Universal (in Spanish). Mexico. Archived from the original on June 28, 2007. Retrieved 2009-03-24. Taylor, William Cooke, Charles Duke Yonge, and G.W. Cox. The Student's Manual of Modern History; Containing the Rise and Progress of the Principal European Nations, Their Political History, and the Changes in Their Social Condition; with a History of the Colonies Founded by Europeans. 1880. Palat, Madhavan K., Social Identities in Revolutionary Russia, ed. (Macmillan, Palgrave, UK, and St Martin's Press, New York, 2001). This page was last edited on 18 April 2019, at 14:39 (UTC).